The Kudzu Files » Mountaintop Removal Mining Permits. Seriously. Mountaintop Removal Mining Permits. Seriously. Many years ago, I saw a cartoon that had two Native Americans looking out at a mountain in the distance. In the second pane, the mountain explodes. In the third pane, one turns to the other and says “I see the Corps of Engineers is at it again”. And so they are. 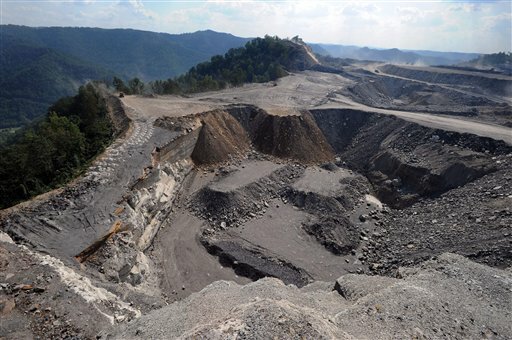 Last week the Environmental Protection Agency gave a compliance letter to the Corps of Engineers for a mountaintop removal mining project in West Virginia. The Corps promptly issued a permit to Hobet Mining allowing the project to proceed. Mountaintop removal is just that – dynamiting a mountain to remove the top several hundred feet of the mountain, exposing the coal seams. It makes it really, really easy to get at the coal, and requires many fewer mine workers. The company is then allowed to dump the dynamited material in valleys below the mountain. Lots of dirt, along with mining waste, is deposited into the valleys, waste that includes all sorts of toxic materials – arsenic, selenium, mercury, heavy metals, which have this annoying habit of finding their way into streams and aquifers, the Clean Water Act notwithstanding. The Bush Administration’s version of the EPA allowed this waste to be classified as “fill”, a technical classification which carried far fewer environmental regulations. I’m guessing their criteria was something along the lines of “Does it glow in the dark? No? Well, OK!”. Seriously, the idea of regulating mountaintop removal from an environmental perspective strikes me as something not far short of absurd. I’m not going to argue that we shouldn’t be using mountaintop removal as a mining method, even though it’s horrible for the environment. But if we’re going to allow it, we should stop this pretense that it can be done in an environmentally friendly or sensitive manner. The EPA estimates that mountaintop removal has removed about 500 mountaintops and buried about 2,000 miles of streams in the US. That didn’t adversely affect the environment of those streams – it obliterated it. Issuing environmental permits for this activity makes as much sense as putting smoke detectors in a blast furnace. Lovely sight, isn’t it? And it’s not enough to ruin the mountain. We also ruin the valley below. Two for one. Not to mention that chorus of blasts that salute local residents constantly. So, let’s stop this farce of environmental regulations. Let’s just say “we want the coal, and we don’t give a damn about the land or the people”. After all, God forbid we should try to find a way to make do with a little less electricity. Not while there’s still mountains out there, anyway.